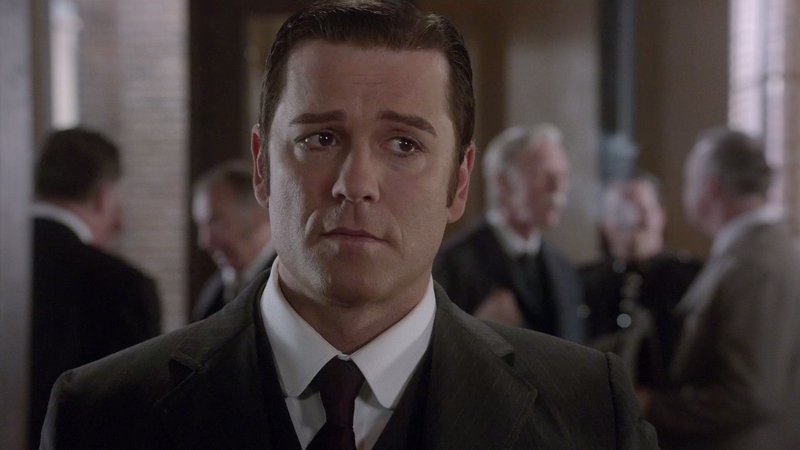 Now in its eighth season, Murdoch Mysteries continues to run as a smoothly oiled detective show. The long-running Canadian show has garnered a huge fan following over the years with its engaging cast of characters and tight plotting. Known to Americans as The Artful Detective on Ovation, the obscure cable channel, the crime procedural drama is set in Toronto of the late 1800s. Originally based on the novels of Maureen Jennings, the show has become an institution on Canadian television. Season eight marks the momentous moment fans have been waiting for a long time, the wedding between Detective Murdoch and Dr. Julia Ogden. For new fans, Det. 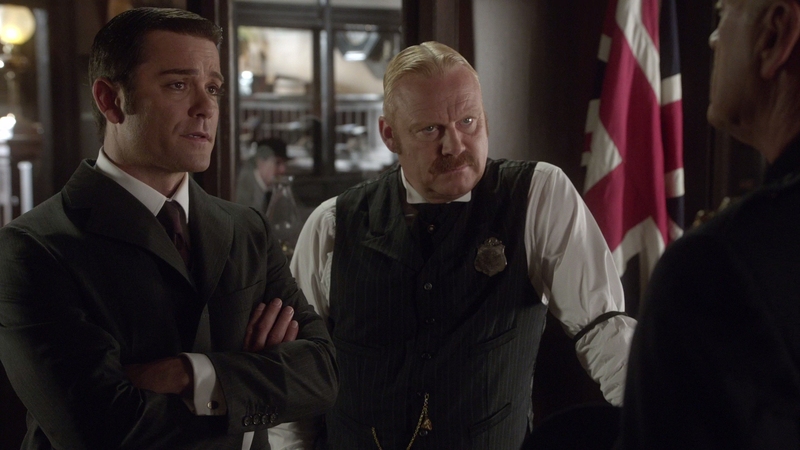 William Murdoch (Yannick Bisson) and Dr. Julia Ogden (Hélène Joy) continue to fight crime in season eight as they solve police mysteries around Toronto. The period piece is a nice throwback to a simpler era of television with its middle-of-the-road entertainment and clean writing. Some may take that as a criticism but I consider it a refreshing change of pace from the utterly grim, dehumanizing crime dramas the American networks keep churning out by the year. There really isn’t anything like it left on our broadcast networks. 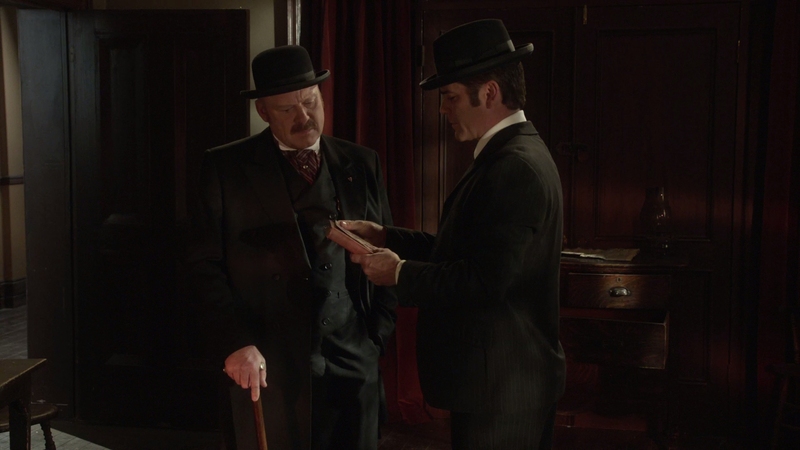 Murdoch Mysteries is lightly serialized enough to keep fans interested in the ongoing arcs without interfering too much in each week’s crime. 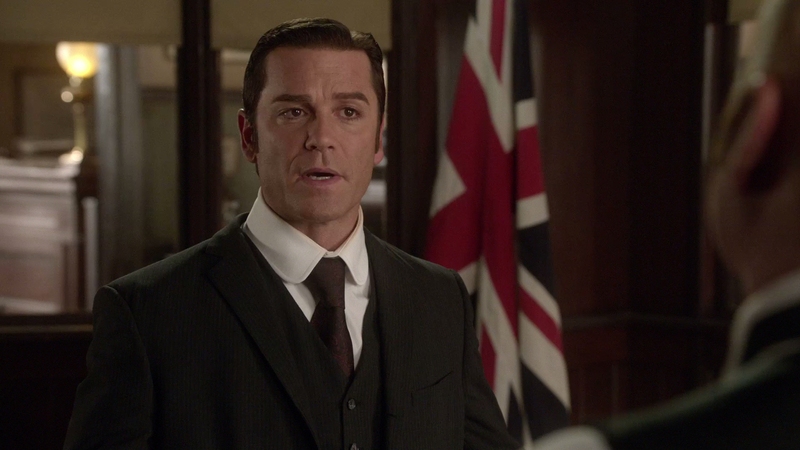 It is an entertaining formula that has been perfected over 100 episodes, bolstered by a very likable cast led by Yannick Bisson. His Detective Murdoch’s calm, easygoing manner is vastly different from the brooding, tortured cops we see on the rest of television these days. His easy chemistry with Hélène Joy makes them a wonderful pairing as the crime-solving leads. 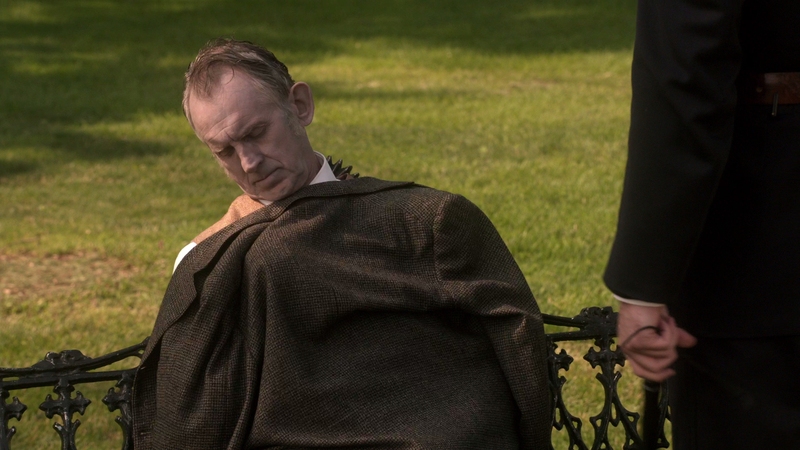 The big event anticipated by fans in season eight is the wedding between Murdoch and Ogden, but so much more happens over eighteen solid episodes. The fate of Inspector Brackenreid, Murdoch’s boss, is answered in a two-part season opener that picks up where last season’s cliffhanger left off. 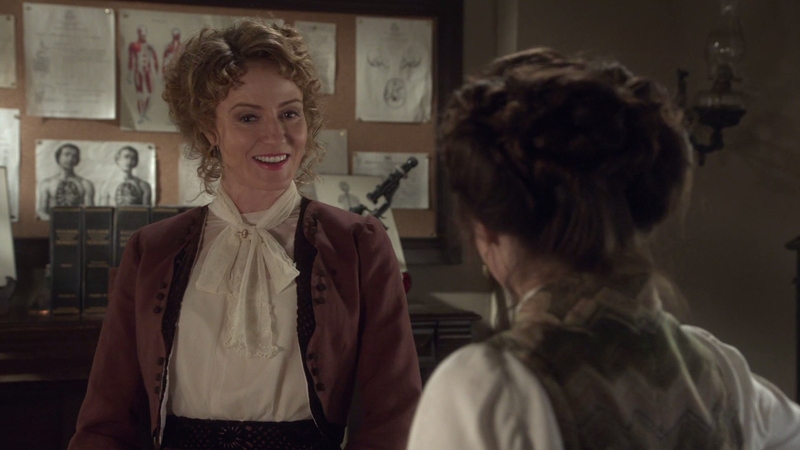 As for Dr. Julia Ogden, much of the season for the spirited doctor concerns her growing role in the women’s suffrage movement. Murdoch’s good friend Constable Crabtree moves from being comic relief to finally enjoying some romance of his own. 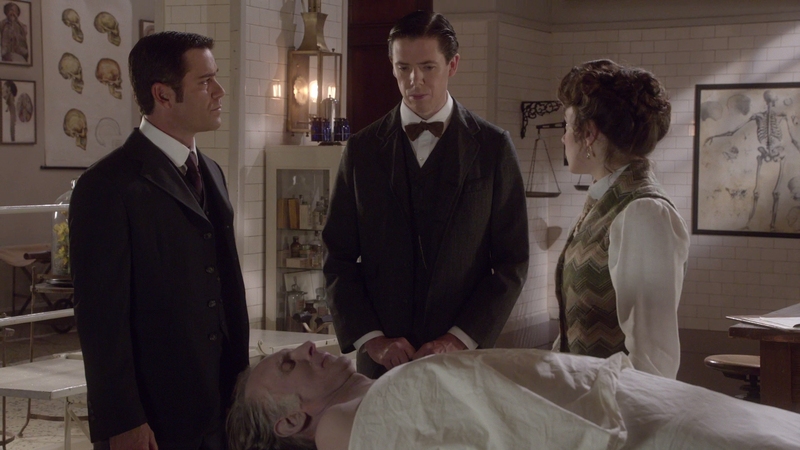 Dr. Emily Grace continues to assist Murdoch with his crime solving as the helpful coroner. The show continues to insert historical personalities into its narrative, having such luminaries appear in Thomas Edison, Theodore Roosevelt, W.C. Fields and Bat Masterson. Their presence adds some necessary spice to the procedural formula, making it far more watchable if you have been watching crime shows for years. 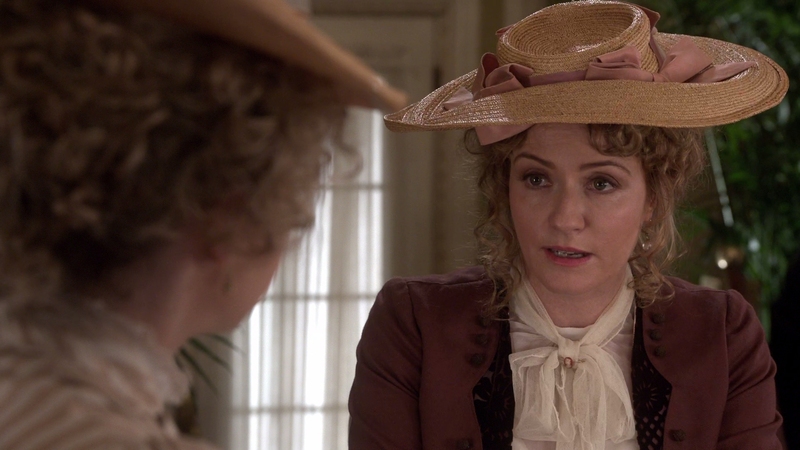 Watching Murdoch Mysteries, one will recognize many of the guest actors as familiar character actors from their favorite American shows. You won’t know them by name but their faces are instantly recognizable. 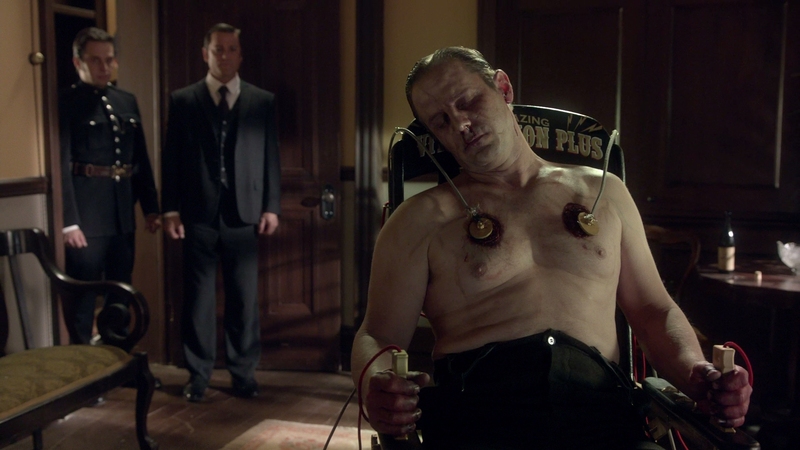 Any show that hangs around as long as Murdoch Mysteries must be doing something right. The show’s light tone and friendly cast of characters make for a perfectly digestible hour of police drama. Its period setting and strong cast make the show a very enjoyable way to waste an hour, even when the mystery is rather forgettable. Season eight shows no sign of the show running out of steam. Bisson and Joy look like they are having as much fun doing the show as ever before in a season that has them looking for the Holy Grail and investigating vaudeville, among other mysteries. Americans should definitely check this engaging drama out with its mix of strong plotting and dependable performances. 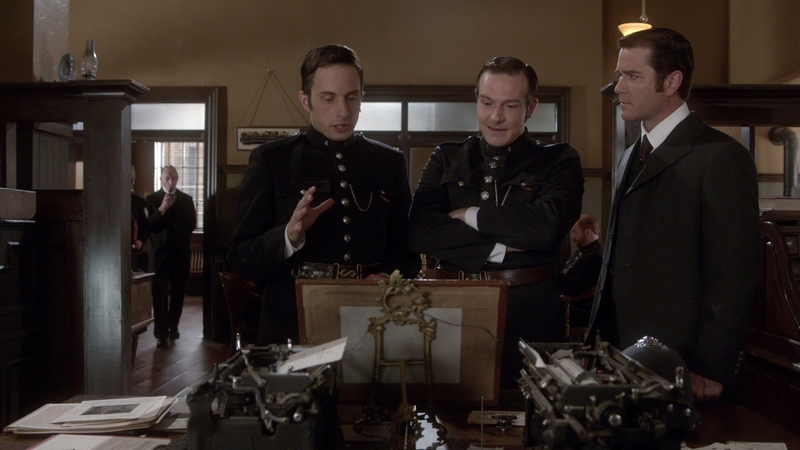 Acorn Media gives Murdoch Mysteries: Season Eight a superb presentation on Blu-ray. Filmed on the high-end Arri Alexa digital camera, the show has consistently excellent definition and clarity. This is nearly flawless video with perfect studio lighting, revealing razor-sharp definition and rich black levels. Close-ups reveal a wealth of detail in the 1080P picture, while more distant shots are not quite as revealing. The eighteen episodes of season eight are spread over four separate BD-50s. Five episodes apiece are slotted on the first two discs. The AVC video encode on them averages a satisfactory 16.83 Mbps for the 1.78:1 video. As the economics of television Blu-ray sales continue to decline, compromises have been made on the disc allotment. Prior seasons of Murdoch Mysteries received a more spacious five discs. The slightly reduced compression parameters don’t seriously impact the video’s standard picture quality. Digital video this cleanly shot rarely stress modern AVC video encodes. If anything, some slight softness is introduced by the lower compression standards that regular viewers won’t recognize. There are no overt artifacts in the pristine image. 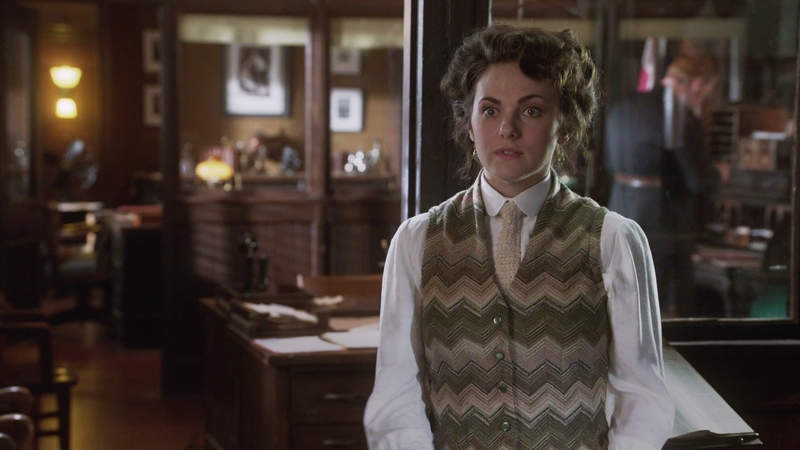 Falling slightly short of reference-caliber Blu-ray video, Murdoch Mysteries’ picture quality is still nevertheless impressive by any standard. This is far more consistent cinematography than we get from American broadcast television, usually filmed by different crews on a rushed schedule. Jim Jeffreys lenses the entire season, producing remarkable video for a television show. A perfect contrast, lovely color saturation, crisp flesh-tones, lush definition- this show has it all in Hi-Def. Acorn Media does a great job by leaving the video alone. Fans that have seen the show before on Blu-ray should expect similar picture quality to prior seasons. Acorn Media provides 5.1 DTS-HD MA audio for the Canadian show. 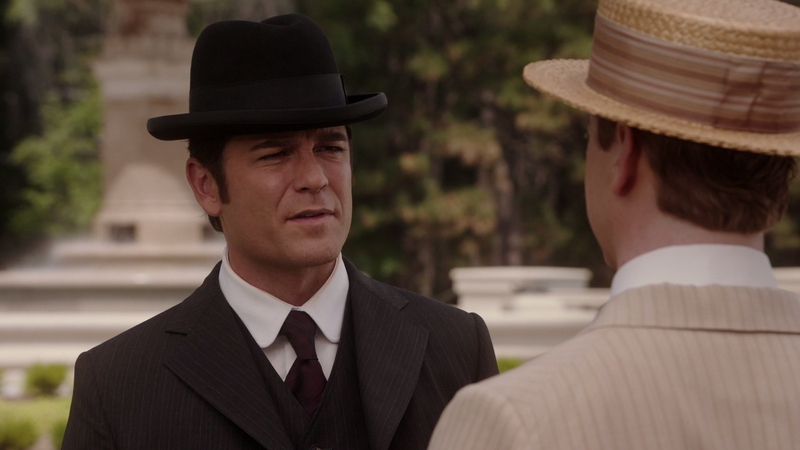 It’s the one aspect of Murdoch Mysteries that falls short of its American rivals. The dialogue-driven drama has some mild adventure and action elements as part of the package but they don’t project the big sound we’ve come to expect from surround mixes. The limited mix is virtually all kept in the front, rarely adding the sweeping, booming action of better mixes. Dialogue is perfectly intelligible and crystal-clear, but this soundtrack lacks much of a surround presence. Most action is kept to the front channels. The music is mastered well and works for this period show despite lacking a more discrete mix. The fidelity is clean and crisp. Now this is a complete set of special features, some of the most extensive and thorough I’ve ever seen for a television set. Every episode receives a making-of featurette called Making Murdoch. These are thoughtful pieces dedicated to the episode, featuring a range of cast and crew interviews. On top of the usual suspects, outside consultants such as historians and architects are brought to intelligently discuss the happenings in each episode. I was astonished at how smart and well constructed each featurette was put together, including a bounty of on-set footage and behind-the-scenes material. They definitely go beyond the standard EPK fluff seen on most special features. Acorn media includes a glossy slipcover with the four-disc set. A leaflet advertising Acorn’s streaming site is included. Acorn Trailers (05:17 in HD) – A series of trailers for other Acorn shows plays before the menu of disc one. Behind-the-Scenes Photo Gallery (01:13 in HD) – A series of slides showcasing production footage. Making Murdoch (All in HD) – These featurettes are placed on the same disc as the respective episode they each cover.